I feel like Benefit are really on it when it comes to new products launches - they always seem to be releasing new and exciting products and their recent launch comes in perfect timing so we can all look sun-kissed and faux that glow all Summer long. I'm sure you've all heard of Benefit's Hoola bronzer as it's one of their most popular products and for good reason too - it's an amazing matte bronzer that's perfect for contouring and generally warming up the whole complexion! With this being said, you can imagine my excitement when I found out Benefit were releasing three more Hoola products to sit alongside the bronzer! 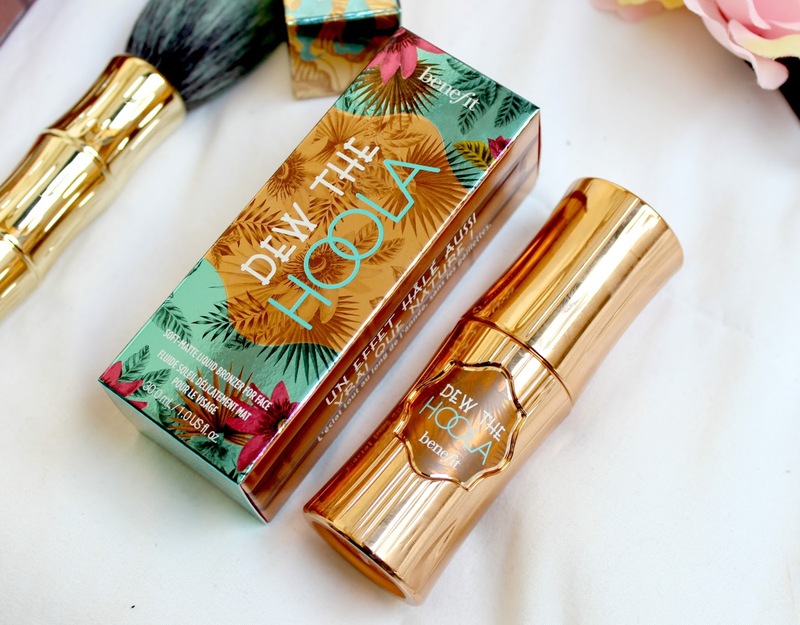 I actually first heard talks about there being some new Hoola products at a Benefit event earlier on in the year so I'm so pleased they're finally here and I can share them with you all as I just know they're going to be such a popular choice this Summer. The three new products are all designed around tanning, faking that Summer glow and perfecting the complexion and lets face it, who doesn't want all of those things? 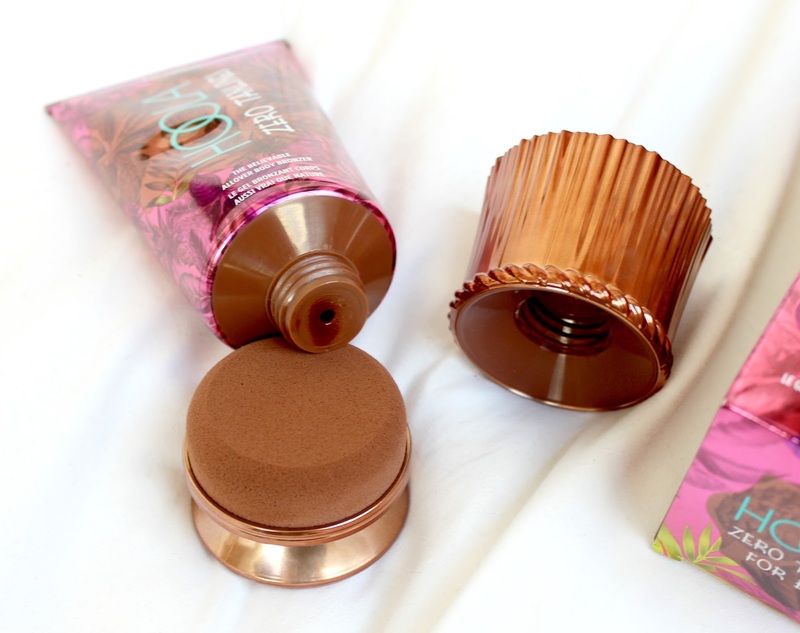 There's two new beauty products and also a brush designed to use for bronzing yourself up with their well-loved Hoola bronzing powder. The two products are named Hoola Zero Tanlines and Dew The Hoola, whilst the brush doesn't really have a name and is instead branded as the Hoola bronzing and contouring brush. Before I get on to explaining the products and what they do in a little more detail, can we please discuss the packaging? Oh my goodness, I just love it. It screams Summer! The original Hoola box has a bamboo design and I love how Benefit have kept that consistent with the three new products, as well as a splash of colour from the exotic looking palm tree print. So, now we've talked names and packaging, it's time to discuss the products themselves! First up we have Hoola Zero Tanlines which is a body bronzer or in more simple terms, an instant fake tan. If any of you used to be a big fan of Rimmel Sun Shimmer (I know I was! ), then this will be right up your street as it has a similar concept with a nicer and less streaky (aka rain/spilled drink resistant) formula. Benefit say this is a 'hands free' bronzer because of the nifty little sponge that's built into the lid of the product. As always, Benefit don't do things by halves when it comes to their packaging. I have to admit, I do find it a little unnecessary as the sponge isn't that big and therefore can't cover large areas of the body very quickly or easily. I'd personally rather stick to a tanning kit but that's just my personal preference. The product itself is a very dark brown liquid (again, think Rimmel Sun Shimmer, just slightly thinner) and when blended into the skin, it provides a subtle bronze and dewy look. I also found that it applied nicely with no streaks which is definitely a good thing when it comes to tanning products. Benefit say this will last on the skin for 12 hours and won't transfer to clothing so again, this is another bonus. However, part of me thinks I'd rather use a normal fake tan that doesn't wash off. If I'm going to make the effort to tan myself, I want it to last so with this being said, this product probably isn't something I'd rush out to buy. It will definitely come in handy on those spontaneous nights out when I need an instant tan that won't streak at the sight of some rain but it definitely isn't an essential in my opinion. 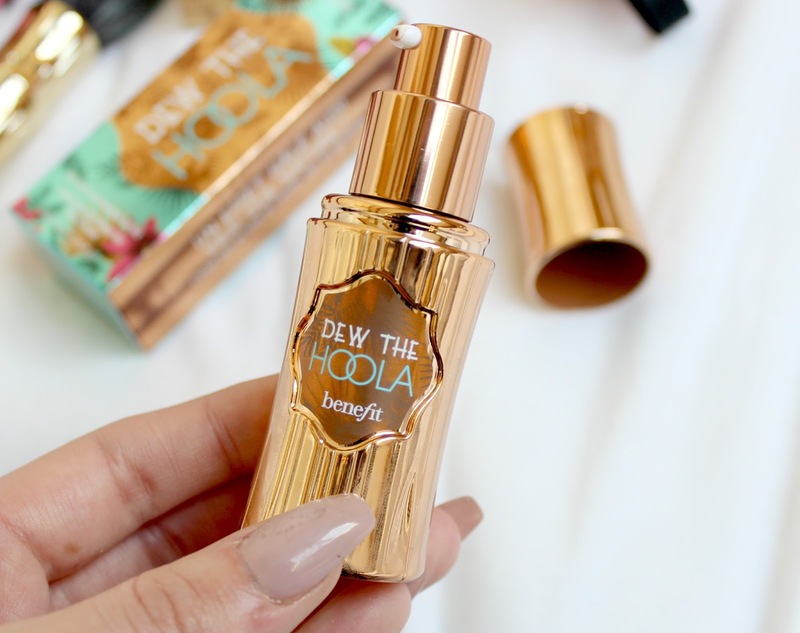 Next up is Dew The Hoola and this is a liquid face bronzer designed to give your face an all year round glow. 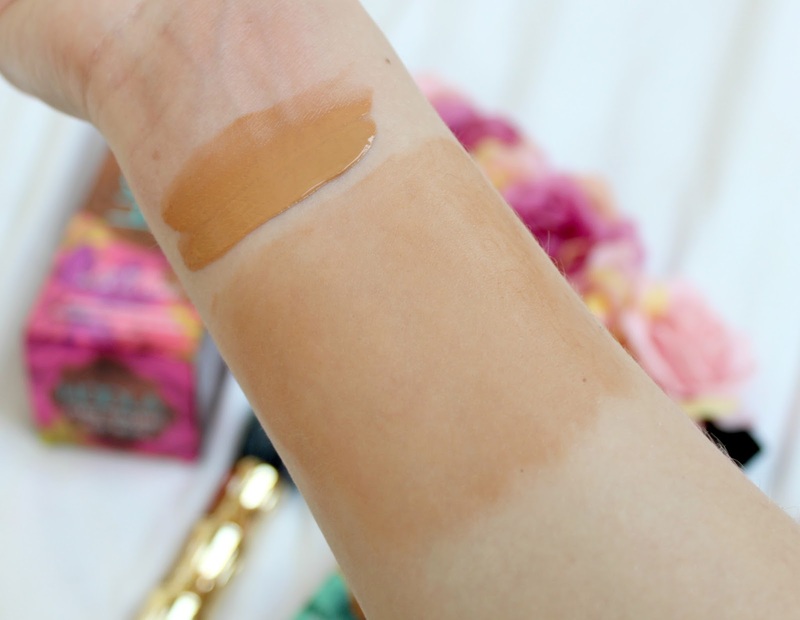 When I first swatched this product on my wrist, I was concerned at how Orange it looked but as you can see from the image above, when blended in, it has a much more subtle look. Unlike Zero Tanlines, this is a product I can see myself getting much more use out of. I don't tend to like using regular false tan on my face as I find it can go patchy, not do anything at all or break me out. However, as this product is designed for the face, those things are much less likely to happen. The formula is a liquid similar to that of a liquid foundation and it has a matte finish meaning it won't make your face look like a glitter ball after application. Benefit say it has smoothing effects meaning it will give your complexion a more flawless finish but unless I was on holiday and wanted to enhance my natural tan. I'd be more likely to use it under my foundation to add an extra bit of colour. It's a great product for those times when you've tanned your body and want your face to have some more colour too as it will make the skin a couple of shades darker without looking unnatural. However, I wouldn't advise using this on your face with no tan on the body as it would probably look a little odd! Finally we have the bronzing and contouring brush which is probably my favourite of the three new products as I'm a bit of a sucker for a makeup brush and this one is just so beautiful! As you can see, it has a gold bamboo style handle which is super pretty and the bristles are a black and mint green ombre (if that's how you would describe it?!). Not to mention it's ridiculously soft - I spent a good few minutes just rubbing this on my cheeks when I first received it in the post. Okay, that sounds weird - you know what I'm trying to say! It's really blooming soft and for that reason, I love it. As well as being super soft, it's the perfect brush to use for bronzer, face powder or blush. I wouldn't really say it's a contouring brush as the bristles aren't dense enough for precise contouring but it's perfect to use with bronzer when you just want to dust it around your face to create some warmth. The bristles aren't too big so you can get some control with it, just not enough as I'd like when it comes to contouring as I prefer to use something a little more structured like an angled brush. However, as I'm someone who only makes the effort to contour for nights out, this really doesn't bother me too much. Overall I'd say these are lovely new additions to go alongside the Hoola bronzer and if you're a bit of a tanning addict, I'm sure you're going to love them. For me, I wouldn't say they're going to become essential parts of my beauty routine but they're definitely nice products to have in my collection and ones I'll get lots of use out of this Summer to ensure I'm always nice and bronzer. You can buy them all from various online retailers or at Benefit counters. Zero Tanlines is priced at £19.50, Dew the Hoola is £22.50 and the brush is £17.50. Do you like the look of these products?! This range looks so pretty. Ive never actually tried out the hoola bronzer- I feel like the only person who hasnt. 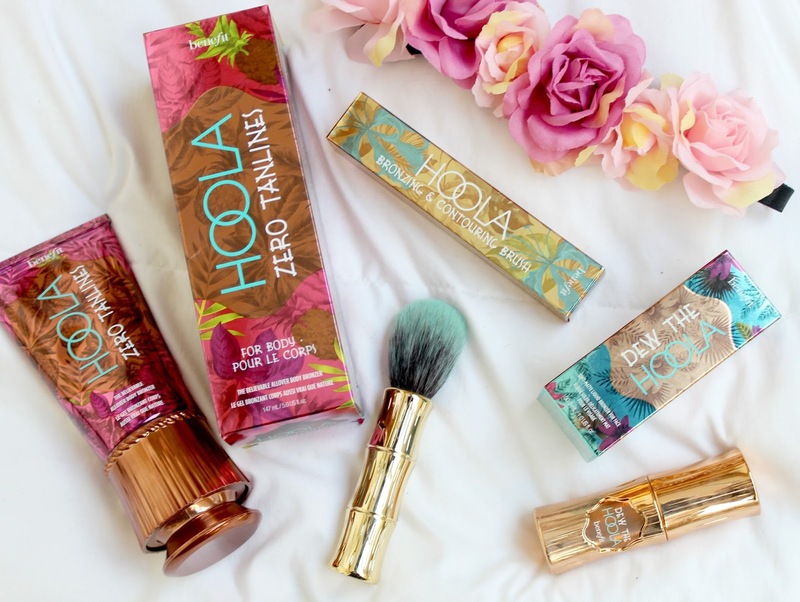 I just adore benefit products and I have no doubt I'll love the new Hoola collection! It's so pretty. Amazing review on these products kayleigh! My Hoola bronzer is my favorite!! I can't wait to try these! 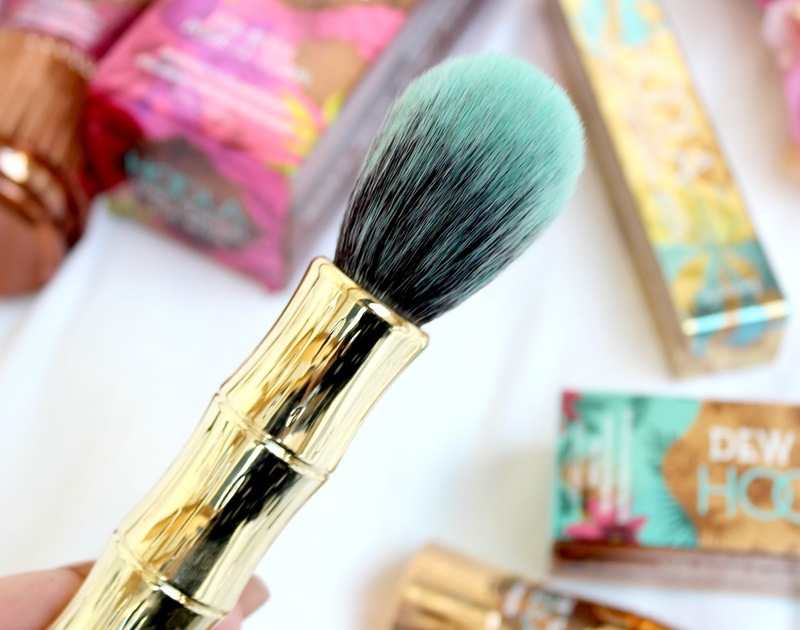 I have never tried hoola from benefit before but I am lovin' that brush! These look like such cool launches. I really need to try that No Tans Lines. Love this post! 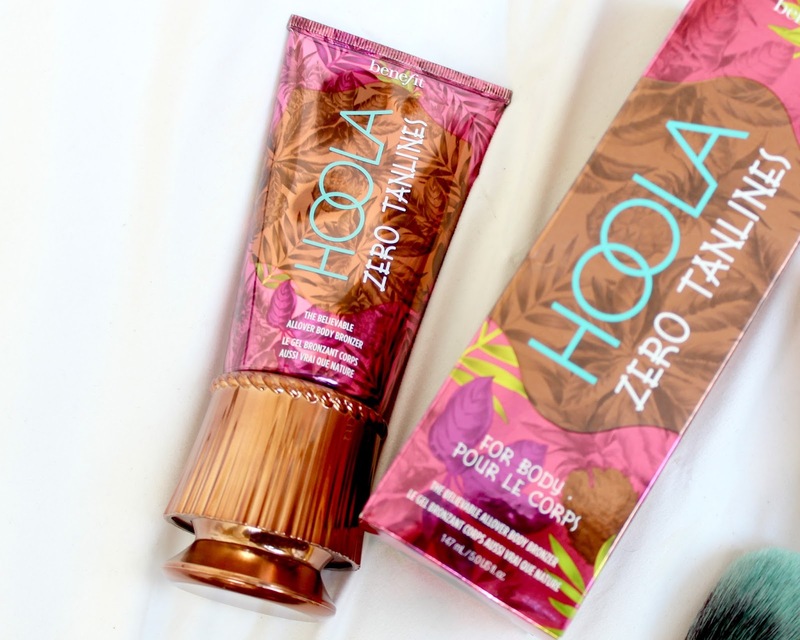 Definitely going to try the Hoola Zero Tanlines this summer! Benefit never fails to impress! That contour brush looks lovely, I love benefit as a brand! Dew the hola seems right up my street! These products look amazinnnggg! Beautiful photos and awesome review! I work for Benefit Cosmetics and they are such an awesome company, definitely doing some amazing product launches lately! I haven't used Dew the Hoola alot (yet!) but I am obsessed with the original powder and that new brush! I love the packaging! I have a fear of Hoola since trying a friends at College which left me looking 'muddy', I've avoided it for the last 10 years! Brush looks gorgeous, and I agree it's probably my fave from the lot. Their new products look so gorgeous, I've tried Dew The Hoola and I really like it! This is such a pretty range! I LOVE that brush. I will have to get this one for my vanity! Ugh. Hello -- I'm blogger myself and always looking to build community with other bloggers. I blog about art/lifestyle mostly but I love reading all sorts of blogs. I was searching for fashion and beauty blogs with good design/the best layouts. I'm hopeful because I actually found a blog I'm going to subscribe to. I've fallen way out of the blogosphere and sometimes I wonder if all bloggers these days are bots or advertisements. Anyway, do you have any sort of advice for bloggers trying to get back into the game and gain readers? I know you've got a lot going on here and are probably very busy keeping it up (I don't blog nearly often enough.. ugh). I'd love to open some communication with you and possibly discuss? I know this is odd but I'm studying the law of attraction as well and I've realized how to get where I want to be is good to talk to someone who is successful in this area and has relevant advice or friendly communication about it! I'm also very open to having coffee or tea and travel a lot for business (I'm also an artist and designer). 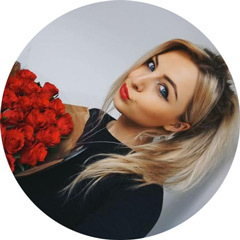 I've also heard of these new sorts of opportunities for promoting your content or work like sites that offer perks for social media status, blog listings like bloglovin and millions of other, as well as sites where you can actually earn money and promotional opportunities by having good content like Advowire (https://advowire.com//users/profile/new?referral_code=AW36707). What do you think of these sorts of sites and do you use them for your social media to promote content or earn more?